First of all, Alfred Peet, founder of Peet’s Coffee died today. Here’s a little bit on Peet’s from my post about coffee roasters. Thanks to Laurie, who commented here that she found a Wednesday hiking group in Marin that has an offshoot group of Wednesday hikes in the East Bay. I like that many of the Marin hikes meet at a bus stop, and also noticed that one of the upcoming East Bay hikes is one that I had been hoping to do myself, a trek from Orinda BART over the hill to Berkeley BART. I also ran across the Weekly Wanderers all-women hiking group, which has regular East Bay hikes and urban walks in Berkeley and neighboring cities. Glancing through the group’s message archives, it looks like there are quite a few that are transit accessible and others that have carpools from Berkeley. Also, thanks to the ever-observant Georgia for pointing out the recent Chronicle food section article about healthy after-school snacks, which has suggestions from Berkeley Unified School District’s nutrition services director Ann Cooper. I had actually recently checked out Cooper’s book, Lunch Lessons: Changing the Way We Feed Our Children, from the library. The book has a bunch of recipes from Cooper, from the Chez Panisse Foundation, and other sources, if you are looking for more child-friendly and healthy food ideas. Catching up on the Berkeley Daily Planet, I found that they have a review of Eccentrics, Heroes, and Cutthroats of Old Berkeley, which I mentioned in my last post. Another recent issue has a series of articles on getting around Berkeley without a car, covering walking, transit, and bicycles. It’s always exciting to run across other people’s walk-every-street projects. Actually, I’ve been reading Eric Fischer’s blog for awhile because he often talks about walking and neighborhoods; now he’s started his walk of every street in San Francisco. In his blog, Eric also pointed out a couple of recent walking articles that I had missed: A New York magazine article discussing walking and longevity, and a series of articles in the New York Times about “what might be called long walking, regularly walking 20, 40 or 60 blocks to work, school or appointments.” Both of these are very interesting reads. Last year, around the 1906 San Francisco earthquake centennial, I did a fair amount of reading on early San Francisco life. Some of my favorite reading was about the various odd characters, so I was pleased to run across the recently published Eccentrics, Heroes, and Cutthroats of Old Berkeley. I haven’t read it yet, but the chapter titles look enticing, such as “John E. Boyd: The Boss Baggage Buster of Beautiful Berkeley” and “Henry S. Peterson and the Berkeley Lawn Mower Invention.” Berkeley Public Library doesn’t seem to have this on order yet, but I submitted a suggestion for the title. Also in the new books department: Inkworks Press, which I mentioned in my post awhile back about Worker Cooperatives, has a new book showing over 400 photos of some of the posters it has printed since the cooperative was founded in 1974. If you’re in Berkeley, you can buy the book, Visions of Peace and Justice, at Inkworks Press on 7th Street (between Heinz and Grayson). Berkeley Public has a reference-only copy of the book at the main library. When you live somewhere most or all of your life, it’s easy to get to a place where you think you are familiar with long-running events in your community. Earlier this summer I was thinking about how I had probably been to just about all of the street fairs, festivals, and other regular summer events that take place annually in the Bay Area. And if I hadn’t been to some of them, at least I was aware of their existence. I was thinking about this in the larger context of this walk of Berkeley, and how it has slowly made me aware of how exploring and learning about a place and its history, customs, people, geography, etc., have shown just how much more there is to discover about the place where I live. A few weeks ago I ran across the book Opening the Mountain: Circumambulating Mount Tamalpais, A Ritual Walk. Published last year, the book describes an all-day walk (about 15 miles) that circles Mt. Tamalpais (for readers outside of the area — this is a mountain in Marin County, north of San Francisco) with stops along the way for chanting, poems, etc. The ritual was started in 1965 by Beat poets Allen Ginsberg, Gary Snyder, and Philip Whalen, and was inspired by Eastern practices of walking clockwise around a mountain, rock, or some other venerated object or person. I surprised to learn that circumambulation continues to this today, with groups doing the walk on the Sundays nearest the equinoxes and solstices. Of course, I immediately decided that I want to do the walk soon myself — hopefully on around my birthday in a couple of weeks. But how did I miss this? My range of reading and interests covers the Bay Area, hiking, walking, Beat literature, Eastern religion, etc., but I had never run across this particular ritual until now. Doing a bit of searching online, I noticed that most everything I found was book reviews and bookstores selling the title. It was both re-assuring to find an example of something I hadn’t heard about before, and exciting to think about what else is out there that I have yet to discover. Choose a nice road for your practice, along the shore of a river, in a park, on the flat roof of a building, in the woods, or along a bamboo fence. Such places are ideal, but they are not essential. I know there are people who practice walking meditation in reformation camps, even in small prison cells. As if there weren’t enough reasons already to get out the car, here’s another one that I have discovered: walking and bicycling have given me a much better understanding of geography and a better sense of direction. For a long time, I thought I was someone who was doomed to be terrible with directions. Put me in a car, and I probably will always be that way. I think my brain shuts down sometimes when I’m in a car because I’m not particularly interested in filling it with knowledge of all of the freeways, freeway exits, alternative routes to avoid traffic, and all of the other things that are involved in making a smooth trip from point A to B in a vehicle. Outside of the car, though, is a different story. Why is this? Part of it, in my case, is that I enjoy spending a fair amount of time looking at walking and bicycling maps, planning and imagining different routes, and studying the topography of an area. One thing that particularly fascinates me when looking at area maps is the borders of cities and towns. The historical and political development of particular cities and regions is often complex, and often some areas end up forming strange and interesting shapes and patterns on a map! Early on in my walk, I noticed that many times the border between Berkeley and the next city sometimes ran right through a street. In most of these cases, I just walked the full length of a street, because it would be difficult to tell exactly where the border was (and it made for a smoother, though longer, walk). One day I happened to be walking along a section of the Berkeley-Albany border when it was an Albany garbage pickup day. I started laughing when I realized that on trash day I could figure out exactly where the border was by seeing where the line of garbage cans at the curbs ended. After 30 flat blocks, the landscape changes. I’m in Berkeley. 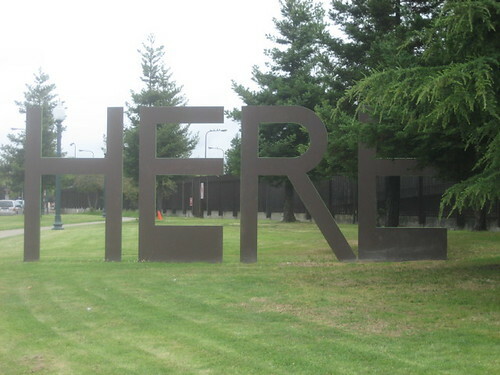 There’s a Nuclear-Free Zone sign and then the gleaming giant words “THERE” and “HERE” — a piece of public sculpture that has always rubbed me the wrong way. “There is no there there,” Gertrude Stein famously said of Oakland, her hometown. Seventy years later, does Berkeley, land of Priuses and million-dollar bungalows, really have to remind us? This entry point to Berkeley is interesting because it is one of the few places I have observed where it is really obvious that you are going from a bordering city into Berkeley. After having walked near all of the borders, I’ve noticed that in most places there is a slow blend from one city to the next rather than an abrupt change where you know you are entering somewhere new. Berkeley’s west border is the Bay, and its east border is mostly either Tilden Park or University of California land. But where Berkeley borders cities (Albany, Kensington, Emeryville, and Oakland), it’s harder to tell when you’ve crossed over. The houses along the north borders of Berkeley are often similar to those of Albany or Kensington. The Claremont area blends with the neighboring Oakland hills. It’s really hard to tell (except for indicators like the Nuclear Free Zone signs on major streets and the Here/There sculpture) when you are going from North Oakland to South Berkeley. When I’ve walked in South Berkeley, I see the same things happening on MLK Jr. Way and on Adeline Street in Berkeley that Carpenter mentions seeing in Oakland. The only border area where there was a discernible change from one place to the other was places along the short Berkeley-Emeryville border — Folger Street seems much like the surrounding area of west Berkeley, but as you turn onto Hollis and across 67th on the Emeryville side, you are suddenly amongst industrial buildings that have been converted to offices and newly built live-work lofts. The quote from this article really brought me back to thinking about one of the original reasons why I started this walk. Do you really have to walk every street?, many people have asked. It may seem like a silly exercise to some, or an obsessive-compulsive project, but as I near the end of walking every street, I am glad I have made the effort to do it. 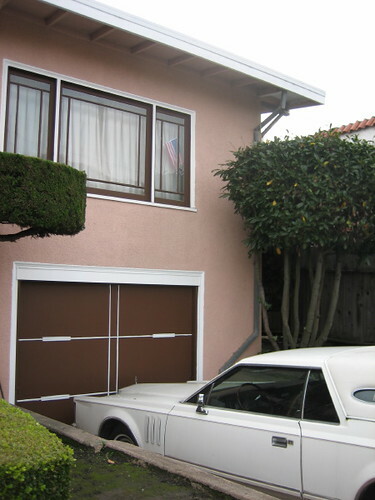 One of those reasons is that Berkeley could otherwise just seem like the “land of Priuses and million-dollar bungalows.” There is no denying there are a lot of Priuses in Berkeley, and there are plenty of million-dollar bungalows — I have seen quite a few of both. I have seen parts of Berkeley that still fit with the image of 1960s Berkeley. But I have also seen that there is a lot of everything else in the range of income levels, types of cars, level of environmental awareness, social behavior, and so on. This morning, for instance, I was reading a new South and West Berkeley Transportation Plan (posted on the city’s Transportation website) which in its analysis notes that (from Metropolitan Transportation Commission findings based on the 2000 Census) “fully 39 percent of South and West Berkeley residents were living in poverty.” Is this number accurate, or has it been adjusted to fit the needs of this study? It’s hard to know, and I have never been one to trust statistics in studies. But based on my experiences having walked in south and west Berkeley, I would have come up with a similar percentage. Instead of just reading this article and wondering whether to believe it, I actually can decide for myself whether it is true from what I have observed. 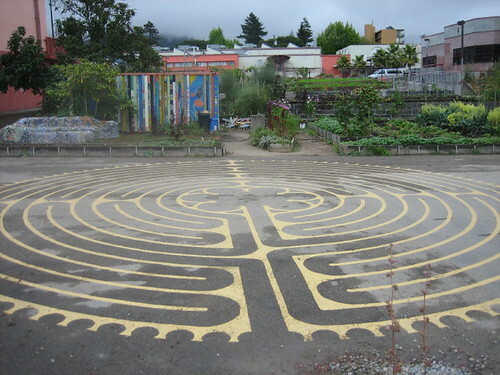 And, hopefully some of what I have written about in this blog has given others a look at the many aspects of Berkeley and has encouraged a few people (my ultimate goal) to get out and walk around their own communities! Also — I’ve found that thinking about borders has been quite a bit of fun, and it has also led me to wanting to spend time in the future walking in small communities that have branched off from the rest of a city (such as Piedmont and Kensington in the East Bay) to see what the borders are like in those areas and what, if any, differences there are between those areas and surrounding cities. In most places I’ve walked, one of the elements of homes that I usually find least interesting is the garages, primarily because modern suburban garage designs seem to be limited to a few styles. One of the first things I learned about garages in Berkeley was that many of them are falling apart. Some are slightly dilapidated, while others look like they are very close to falling apart completely. This is not surprising with the number of older homes in Berkeley, and with the relatively expensive cost of renovating or re-building a garage. Some garages are attached to homes, and many others are separate and located down a long driveway that runs along the side of the house. Most are “one-car” garages (the quotes because most modern cars don’t fit in the garages at all), though I have seen a couple of two-car garages here and there. I have not seen any of the three-car garages that can be found in some suburbs. Because most garages here do not to have automatic doors, and also because many cars are parked in driveways rather than in the tiny garages, you do see most people when they are coming and going. In my dreams, of course, most people would be leaving their house on foot or bicycle, but at least it is not as extreme as the neighborhoods where you never seen anyone because they enter their cars in the garage, open the automatic door, and drive off — all without stepping outside. Last weekend I was down on the Peninsula, and spent some time walking around Palo Alto. I noticed a few instances where circular driveways had been installed in small front yards on quiet streets, which didn’t make sense to me at all. I had to chuckle a bit when I noticed one circular driveway where a car had pulled in and parked on each end of the driveway — defeating its purpose because one of the cars would have to back out anyway. Every once in awhile, I spot a garage door in Berkeley with an interesting geometric pattern, like the one pictured above. I had walked by the garage door shown below on many occasions, but had not noticed the X’s. A couple of weeks ago, coming at it from across the street, it was easier to spot. It’s always nice to have a reminder to keep looking and looking again and again — and then you still probably haven’t seen everything.